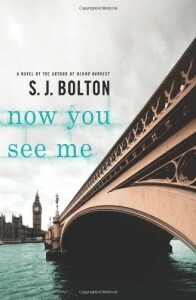 [b:Now You See Me|9783200|Now You See Me (Lacey Flint, #1)|S.J. Bolton|http://d.gr-assets.com/books/1312076936s/9783200.jpg|14673027] by British mystery writer [a:S.J. Bolton|1038226|S.J. Bolton|http://d.gr-assets.com/authors/1270501061p2/1038226.jpg] is one of the most thrillers that I have read in quite a while. In my opinion, there are a few things that all of the best thrillers have in common; a plot that takes me in in such a way that I am compelled to read, intriguing characters, and the author's ability to craft a story in such a way that by the end I feel both satisfied and wrung out. Now You See Me has all of that and more. As far as being a compelling read, this book hit the trifecta. First, from the beginning, when a dying women falls into the arms of the main character, to the very end, this book is filled with the kind of "edge of your seat" suspense that kept me reading far into the night. Secondly, the twists and turns were so well done that the author was able to keep me guessing, even to the very end. Above populating the story with these great twists and turns, the third piece of the trifecta was the author's ability to actually make me question what I thought I knew about the story. There were times when I actually caught myself wondering whether that events as I thought I understood them were real, or just imagined. Add to the above the way the author wove the mythology and lore of Jack the Ripper into the story, and I was hooked. True crime has always fascinated me, and I have spent many reading hours on stories about the most famous, or infamous, criminals throughout history, especially cases where the crimes were never solved. You can see, then, why a book where Jack the Ripper facts and lore feature prominently would be to my liking. I appreciated the care with which the author did her research on Jack the Ripper, and the intriguing way that she wove that information into the story at large. As for great characters, this book certainly fits the bill there. Lacy Flint, the main character is a strong, independent woman with a nebulous background. As the story unfold, we are continually given little pieces of her background that cements the intrigue of her character. The male interest in this story, one Mark Joesbury, appears to have a bit of a questionable past himself, as do many other of the minor characters. I am hoping to see and learn more about Mark, Lacy, and Detective Inspector Dana Tulloch as the series unfolds. By the time I finished reading this book, I couldn't help but feel that I had gotten my time's worth. 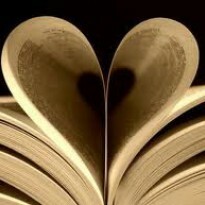 I enjoyed every minute that I spent reading it. Part of that enjoyment was wrapped aroung the feeling that I had of having been through a surreal esperience and being around to tell about it. My feelings were so strong, in fact, that I immediately went out and bought the novella that comes after the book, and ordered the second book of the series from my local library.